My first goal of two additional mortgage payments never materialized. There are two of reasons for that. Firstly, I did an analysis on additional mortgage payments and came to a conclusion it was not the best strategy. Secondly, as a part of relocation for the new job we ended up selling our home. My second goal of $400.00 in dividends in a single quarter happened in 2018 Q4. 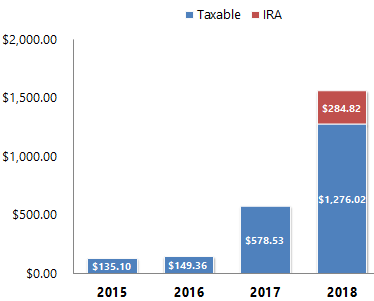 Given that I have a taxable and non-taxable account, I am going to classify this goal as $400.00 in taxable dividends. I got $424.07 in taxable dividends in 2018 Q4. My third goal was $1,500.00 in forward dividends (taxable). This goal was achieved in 2018 Q4. A bit surprised here as I kind of expected to achieve it earlier. My forward dividend as of December 30th is $1,512.61. My fourth goal was to achieve 4,160 vitality points. I was able to ace this goal and got 14,820 vitality points. This is equivalent to $148.20 in Amazon gift cards. I received $3,217.12 in passive income. Even though it’s not a goal I am very happy with this achievement. I also added a new source of passive income. I now sell covered calls using my long-term ETF positions. I set myself a long term goal of being financially independent by 2032. I am currently at 8.059% of this goal. Working backwards I would need to add another 6.646% to this goal by end of 2019. So, my goal for 2019 is to reach 14.705% of my target. In terms of forward dividends I barely managed to reach my 2018 goal of $1,500.00. However, I am sticking with an aggressive goal for 2019 of $3,000.00. This would be $250.00 in dividends per month (awesome!). Given the huge drop in stock market I believe this target is reachable. I have also set myself a goal of $800.00 in taxable dividends in a single quarter. Again a very aggressive goal, but something I might be able to achieve. This would definitely be a stretch goal. With my new job I no longer have access to the vitality program. So, no vitality related goals for me this year. In terms of side hustles I am going to aim for 50% of my 2018 side hustle income. So, my side hustle goal for 2018 is $750.00. How was 2018? What are your goals for 2019? Congrats on reaching your goals! I have also been thinking about making additional mortgage payments, but with the current interest rate (below 1 %) it just doesn't make sense. Even though you have a bit higher rates there, I can understand why you did not make those extra payments. Your 2019 goals look really ambitious too, which is a good thing! I'll try to set much harder passive income goals for the next year too. Just awesome that you achieved your goals. I agree those 2 extra mortgage payments may not be the best use of cash currently, so not a bad one to miss. You had a busy year this year. Nice looking goals for next year. Aiming high and missing is better than aiming low and hitting. Nice work DivGeek - agree missing the mortgage repayment goals probably turned out to be wins in the end! Keep those dividends growing in 2019, hope it's a good year for you. Hey Geek! Happy new year and best of luck on all your goals in 2019. Great job this year, Dividend Geek! Reaching over $1,500 in dividends is an amazing accomplishment. Nice yoy growth as well. Looking forward to your 2019 results. As for my year, I was able to come close to most of my targets. 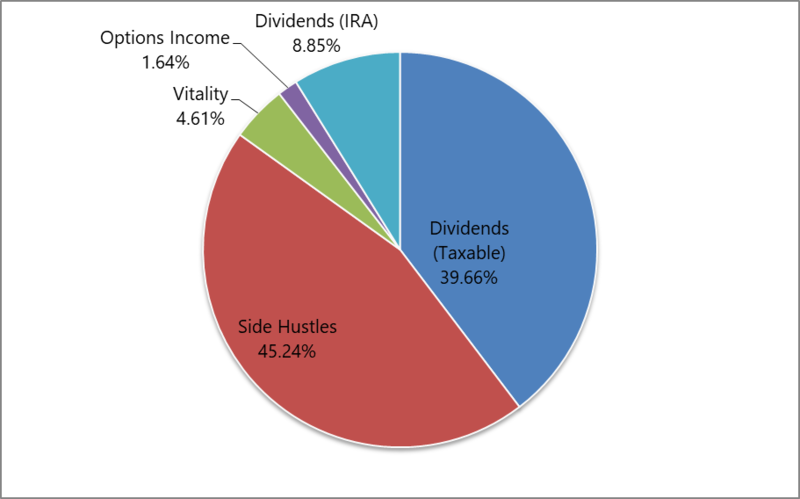 I'm hoping to earn at least $670 from dividends in 2019 and increase the forward dividend income to at least $800. Good luck with your goals this year! Congrats on finishing the year strong Geek and good luck with your 2019 goals. I noticed that you decided against adding two extra payments to your mortgage. I'm faced with a similar dilemma. I'm going through my goals for 2019 and I'm trying to decide if I should pay off my mortgage early. Part of me feels that I should and so I'm reassessing if I can both a) pay down my mortgage early AND b) invest. We will see. But, in any case, I'm just looking forward to following your progress in 2019.